Keeping your children hydrated is very important, especially if they are very active. 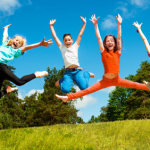 Lots of information and recommended guidelines from the NHS on childrens health. Click the image to visit. Detailed information and resources from the UK government website. Click the image to visit. Dehydration can be serious, especially for growing bodies, so it is important that you keep an eye on how much fluid your children consume during the day. As well as making sure that they are drinking regularly enough, you must also make sure that they are drinking the right things. Certain drinks, such as fizzy drinks, should only be given to children as special treats, because these drinks can be very bad for children to consume regularly. Fizzy drinks can actually cause serious health consequences for children if they are consumed in high volumes. They tend to be high in sugar, high in calories, and hold little-to-no nutritional benefits. Many leading soft drinks also have a caffeine content which can alter the behaviour of young children. The high sugar content will lead to advanced tooth decay over time and can cause hyperactivity in many children. Excessive sugar consumption can also increase the risk of the child developing diabetes. Consuming too many calories over the course of a day can also lead to childhood obesity. Obesity during childhood may cause lasting detrimental health effects. The calorie count in fizzy drinks can mean that calorie limits are reached after a few glasses. Are Fruit Juices Good for Children? Fruit juices are marginally better for children than traditional soda drinks are; however they are not the healthiest choice of drink for children. Fresh fruit juices and fruit juices which are made from concentrate often have a high sugar content. When fruit is pulped, blended or juiced, it releases all of its natural sugar into a form which can increase the risk of tooth decay. When juice is swilled around the mouth, it coats the teeth with sugar which gradually eats away at the enamel on the teeth. On the other hand, fresh fruit juice is normally rich in essential vitamins and minerals. A 150ml glass of fresh fruit juice will count towards one of their 5 portions of fruit and vegetables per day. However, only one portion per day can come from juice because of the health risks that are associated with drinking it. f you do want to give your children fruit juice to drink, you should limit their consumption to one glass of juice a day after a meal. Drinking fruit juice with a meal can help to lessen the impact of the sugar within the drink. Plain water is one of the healthiest choices that you can give to your children to drink. Water is great for rehydrating children, especially if they are playing sports or doing any other physically demanding activity. Cold water tastes great when you are thirsty, because it is so much more refreshing than a drink that contains a high sugar content. You should try to encourage your children to drink water when they are feeling thirsty and throughout the course of the day. Many schools in the UK let children keep a bottle of water on their desk with them during school hours, because adequate hydration is known to help to boost concentration and improve learning. Cow’s milk is a perfect choice for your child, if they are able to drink it. Many children prefer the taste and creamy texture of milk to the flavour and texture of plain water. It is easy for them to drink milk whilst they are at home, although fresh milk should not be taken out and about because it needs to be kept refrigerated. 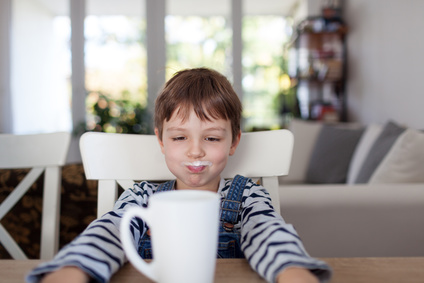 Young children should have whole milk, rather than skimmed or semi-skimmed milk. Whole milk is best for children between the ages of one and two because it contains vital nutrients which help children to grow. Lower fat options should not be considered for younger children, as they are not as beneficial for children of a young age. 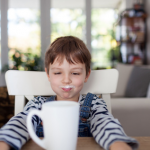 Skimmed milk options are not suitable for children under the age of 5. Milk does not decay the teeth in the same way that fruit juice and fizzy drinks do. The calcium content of the drink is great for healthy teeth and bones. An adequate calcium intake is essential for growing children. You don’t need to stick to one drink all of the time. Choosing a mixture of water, fruit juice and milk is likely to give your child a really healthy start to life. Giving your children the right foods and drinks is very important, because young bodies require the right nutrition to grow and develop. It can be very difficult to find the right balance, especially when children are very young. One widely debated topic is whether fruit juices are actually good for children? Although some nutritional specialists have previously advocated fruit juices over fizzy drinks, more and more doctors are now warning that the consumption of fruit juices should also be restricted. There are still health benefits available from fruit juices, but they should be enjoyed in moderation rather than being the drink of choice. Fresh fruits are known for their great taste, so many children are pleased to be offered fruit juice. Many children prefer fruit juice to drinks like water or plain milk, because they enjoy the flavour more. This means that it can be easier to encourage children to stay adequately hydrated, especially during the summer time. However, the taste that children crave is often down to the high sugar content. Most fruit juices are very sweet because of the high natural sugar content. Most fruit juices do contain a range of essential vitamins and minerals. The nutritional balance of the juice will depend on the mixture of fruits, as well as the processes which were used to get the juice ready for sale. Some preparation processes which are used in large scale manufacturing, including pasteurisation, can actually reduce nutritional benefits of the ingredients that are used. If you want your children to consume fruit juices for the health benefits of fresh fruit, it is often better to make your own fresh juices at home using a blender or food processor. However, well prepared fruit juices are packed with vitamins and minerals. For example, freshly squeezed orange juice will normally give your child all of the vitamin C that they need for the day. 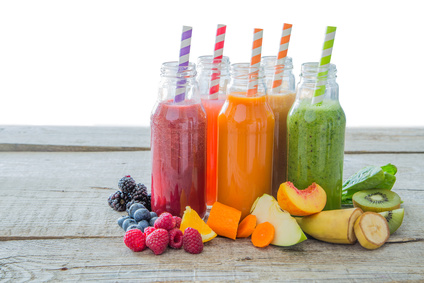 Fresh juices can make up one of your child’s “5-a-day”, to help them to reach their daily target. You only need to consume 150ml of juice per day for it to count as one portion of your daily target. The main risk from drinking too much fruit juice is related to the high sugar content. The natural sugars which can be found in fruit juices can cause tooth decay. Most fruit contains high levels of fructose (fruit sugar) which is released when the fruit is blended or juiced. This sugar is not released in the same way when whole fruits are consumed. Because the juice is swilled around the mouth whilst it is being drunk, the sugar is able to coat the teeth. The longer that the sugar is allowed to be in contact with the surface of the teeth for, the more that it is able to decay the surface of the tooth. Eventually cavities are able to form which can be very painful. As well as having an effect on infant teeth, too much sugar can be bad for your child’s adult teeth when they start to come through. To reduce the harmful effects of the sugar that is present in natural fruit juices, you are advised to only allow your children to drink fruit juice at mealtimes. Because of the amount of the higher sugar content in fruit juices, it is also possible that they might have a high calorie content. If your child consumes more calories than they burn through daily activities, then it is likely that they will put on weight. 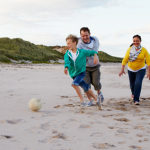 Childhood obesity can increase the risk of ongoing health-problems in later life. Because parents often feel as though fruit juices are the healthier choice, they do not always consider the calorie content of these drinks. This can lead to excessive calorie consumption. Although children should not be taught to calorie count, parents should be aware of foods and drinks that may contain a high number of calories. Producers often use misleading labelling when they are marketing fruit juices and similar products. They may use words and phrases which make the drinks seem much healthier than they actually are. Many products that are labelled as “juice drinks” have high sugar contents but do not offer the same health benefits that fresh fruit juices offer. These may not count as one of your “5-a-day”. Most consumers do not have the time to check the labelling of every single product that they buy, and therefore have to take most things on face value. If you do not have time to understand the labelling of store-bought fruit juices and “juice drinks”, then you may want to avoid them and choose homemade alternatives, water or milk, so that you can make sure that your child does not end up with a sugar-loaded drink with no health benefits.